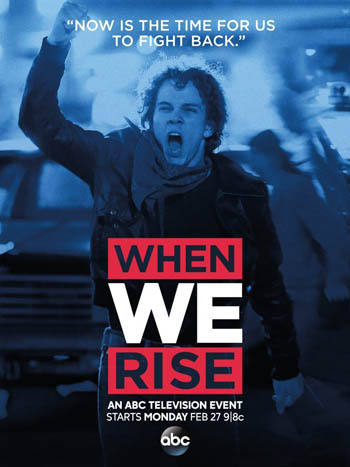 NEW YORK (CNS) — Catholic viewers will likely have experienced conflicting emotions watching “When We Rise,” ABC’s recent miniseries tracing the evolution of the gay rights movement. As it portrayed the intersecting lives of three prominent figures in that movement, the show reflected the undiscriminating outlook of the culture at large rather than the balanced perspective offered by the church. The program blended the personal with the political as it covered an ambitious time frame of over 40 years, beginning in San Francisco in 1972 and ending with the Supreme Court’s 2015 decision in Obergefell v. Hodges. Given the decades-long scope of the narrative, it’s not surprising that each of the trio of main characters was played by two actors. Thus, Austin P. McKenzie portrayed activist Cleve Jones in youth, while Guy Pearce took on the role of the older Jones. Similarly, Roma Guy was played first by Emily Skeggs, then by Mary-Louise Parker. And the role of Ken Jones was divided between Jonathan Majors and Michael K. Williams. There was sometimes a lack of continuity between performers, however, most notably where the Cleve Jones character was concerned. For instance, Pearce was more demonstrative with his gestures and his Jones smoked continually while the younger man didn’t. In touching on both historic events and a wide range of personal attitudes toward homosexuality, miniseries creator Dustin Lance Black presented his story as a straightforward one: the gradual triumph of tolerance over prejudice. His script, accordingly, portrayed all those who opposed the gay rights movement — at any point in its history — as, essentially, bigots. For viewers committed to scriptural values, on the other hand, careful discernment was required to separate those goals of the movement that were properly rooted in the inherent dignity of each individual and those that forwarded a vision of society contrary to revealed truth. For the most part, that divide is a chronological one. The Nixon-era fight against discrimination in employment or housing is, after all, quite distinct from the more recent agitation for a redefinition of marriage. But Black would have us see only stages on a single, progressive path. Because of this, viewers may have felt as they were being fed their history, as if they were children being made to eat their vegetables. De-emphasizing the characters’ personal journeys, the series became less engaging. The parallel with the African-American civil rights movement, which is not at all as direct as some would maintain, is established as Vietnam War vet Ken Jones is transferred to San Francisco and placed at the head of the Navy’s desegregation program there. The bona fides of his two counterparts are also presented early on as Cleve Jones’ Quaker faith inspires an interest in social justice and Guy’s stint in the Peace Corps lays the foundation for her work on behalf of the National Organization for Women. As with Black’s 2008 film “Milk” — whose protagonist, San Francisco Supervisor Harvey Milk (1930-1978), also figures here — judged simply on their own terms, some of the reforms the central figures agitate for can be supported by viewers of faith. But when these early changes become steppingstones toward reshaping the family and silencing even calm and reasoned opposition to a view of human sexuality at odds with the Bible, they can no longer simply be assessed in isolation. That’s why the varied cultural and ideological elements found in a sweeping retrospective like “When We Rise” need to be sifted with the utmost care.